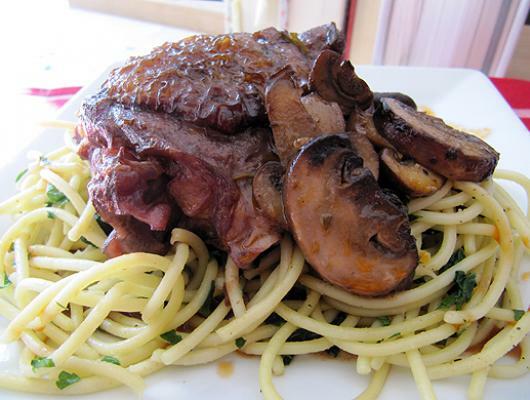 1) Brown mushrooms: Melt the butter and olive oil in a large sauté pan over high heat. Once the butter has melted and the bubbles in the mixture have started to subside, add the chopped mushrooms. Stir continuously, allowing the mushrooms to absorb the butter and oil mixture. After a few minutes, once the mushrooms have begun to brown and release their juices take off heat. Sprinkle with dash of salt and freshly ground black pepper. Set aside. 2) Brown braise onions: Melt butter and oil in a large sauté pan over medium heat. When the butter and oil mixture starts to bubble, add the onions. Roll the onions in the mixture to ensure as even browning as possible. Once the onions are brown, which takes about 7 minutes, add the red wine, chicken broth and bouquet garni. Bring the mixture to a boil, then cover and reduce heat to low, simmering for 35-45 minutes, or until the braising liquid has evaporated. Remove bouquet garni. Set aside. 3) Prepare garlic and herb paste: In small bowl, mix together fresh herbs, minced garlic, butter and salt until a paste is formed. 4) Prep and braise chicken thighs: Under the skin of each chicken thigh, generously spread garlic and herb paste. In a Dutch oven or large pot, melt the butter and olive oil over high heat. Place the chicken thighs in the Dutch oven, making sure the pieces do not overlap. You want the pieces of chicken to get nice and brown. Brown both sides of the chicken, about 6 minutes each. Once browned, add the red wine, chicken broth, tomato paste, and bouquet garni. Bring to a boil then lower the heat and simmer for about 30 minutes, until the chicken is tender and cooked through. Remove bouquet garni and stir in the browned mushrooms and braised onions. 5) Prepare herbed noodles: Cook spaghetti according to package directions. While still hot, place cooked spaghetti in a large bowl, and coat with butter and garlic oil. Toss with parsley, oregano, tarragon, and arugula, and sprinkle grated cheese. To serve, plate noodles with chicken and sauce on top. This is a recipe for those lazy weekend days where time is in abundance. Though there are a lot of steps, some of them can be done and then set aside. I like to get the mushrooms browned and onions braised, then take a break and finish the rest later in the afternoon. French cooking techniques allow you to get some truly decadent flavors and textures, and we love the way the herbed noodles underneath pick up all that thick, delicious sauce.